A Kielo Wrap Dress pattern hack! 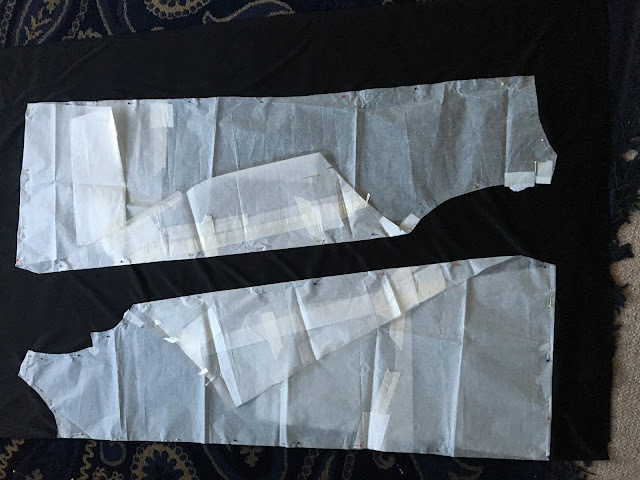 I skipped the back darts, and removed the big triangles that wrap around the waist - you can see them folded in on my pattern pieces - by straightening the side seams from the armhole downwards. 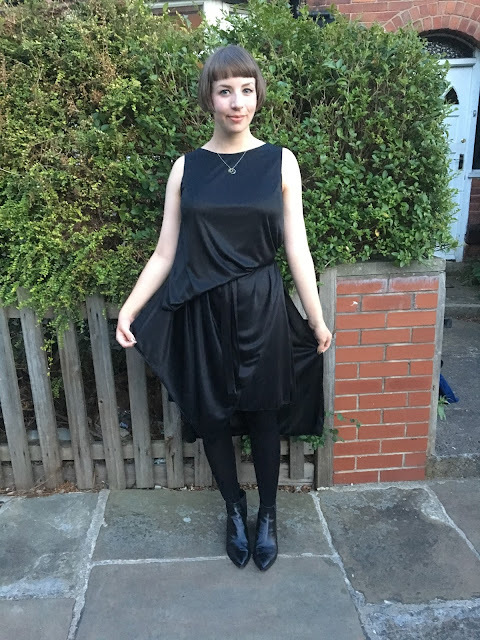 The base dress is cut just above knee length (this was a bit of an accident as I wanted it slightly longer) and the overlay pieces are midi length, and slightly wider as I included an extra 1.5cm allowance for hemming the side seams. First up, I hemmed the sides of each overlay piece, as I wanted them to hang freely and separately during wear. This also means that I can style the dress differently - e.g. belt one overlay piece in and leave the other to hang loose - but more on that in a bit! I sewed the bust darts on both of the front pieces as normal. Then I basted the two back pieces and two front pieces together at the neck lines, shoulders and arm holes. I stitched the shoulder seams together, treating the basted base pieces and overlays as one. 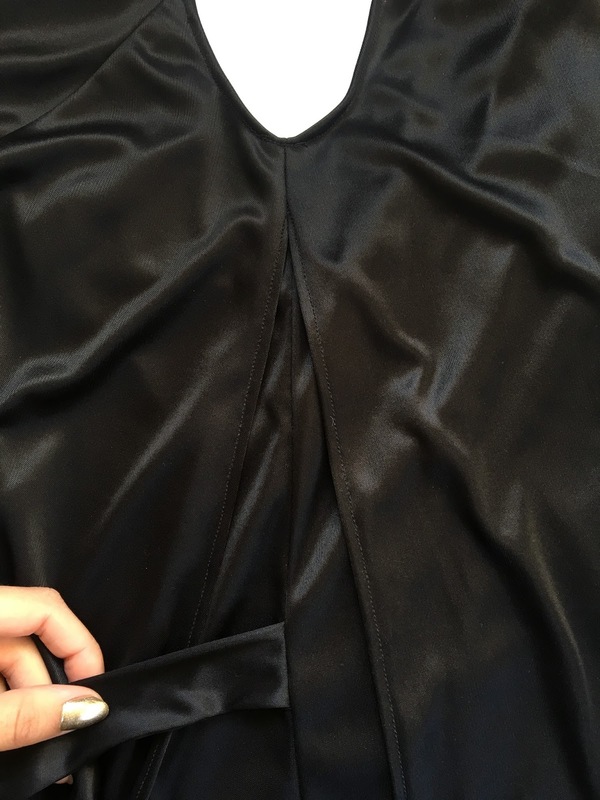 I sewed the side seams of the base dress, being careful only to catch the overlay sections in at the very top, just under the arm opening (see the picture above). The dress has waist ties inserted into the side seam like the regular Kielo does. I added a little extra to all of the edges when cutting as the Kielo has a small seam allowance (1cm) and I knew I'd be working with a bit of extra bulk due to the layers. 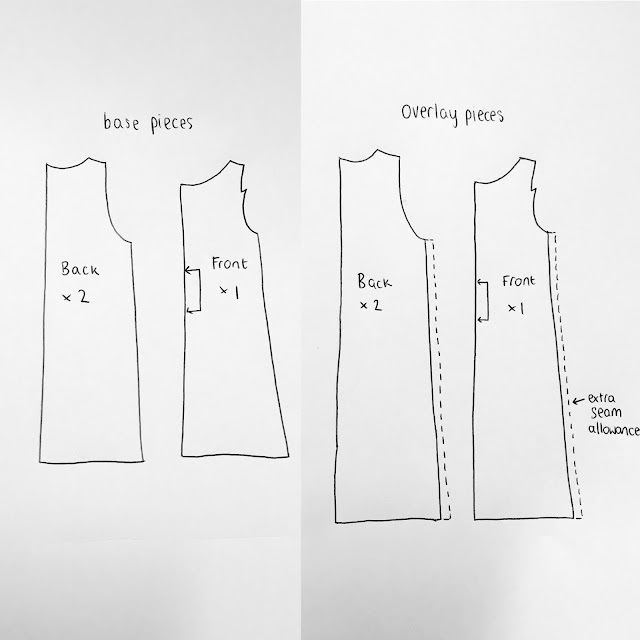 I could only turn the neckline under once due to the bulk, but luckily my fabric didn't fray one bit. It's a black, poly/synthetic, slightly sheer, one way stretch, with a bit of a shine to it - the sort that fills me with dread after a difficult experience working with something similar when making the Driftless Cardigan. In the end I got on just fine using the finest needle I had and a walking foot. 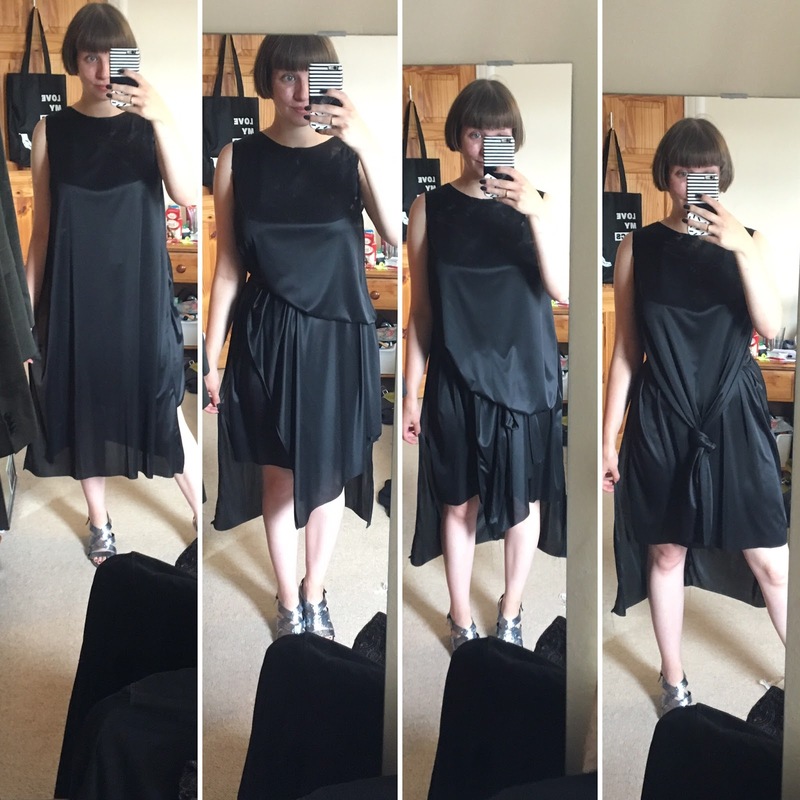 I really love that the finished dress can be worn in so many different ways - something I hadn't really considered when working out the original concept. There's the fairly conservative day dress, the 'high fashion' tent, the 'little bit PJ Harvey/little bit Vivienne Westwood' look(s). 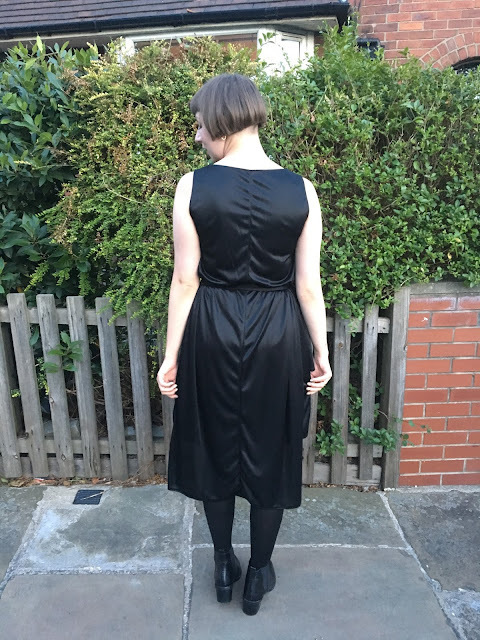 There's also an ever-so-slightly 'Strictly Come Dancing' look when you wrap it some ways - I think this might be the sheen of the fabric, and yes, I'll probably be avoiding this look! 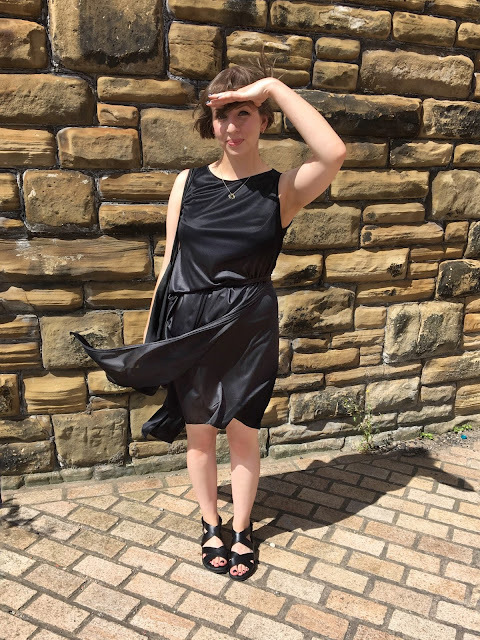 I'm thinking of wearing it to a September wedding, which feels very prepared for me - I was sewing my Martha dress and culotte jumpsuit right up until the last minute for the other weddings I've already been to this year. It's also a good thing that I'm prepared for once, as I'm very lucky to be off to Chile with work this week, so I'll be spending a bit of time away from my machine (*sob*). A windy outtake - I definitely has the desired movement! Thats fantastic. seeing the 4 (i am sure there are more) variations is brilliant. how versatile. I love it - I love the way it falls in version 1, and I think version 1 is probably the most curious as when you see what comes after.... I am wondering - how did she do that! This is brilliant! And I love how it looks in the main photos. I keep seeing such lovely versions of Kielo that I think it's time for me to check it out! Love this!!!! What a creative dress, from such simple pieces. Even better than the inspiration. 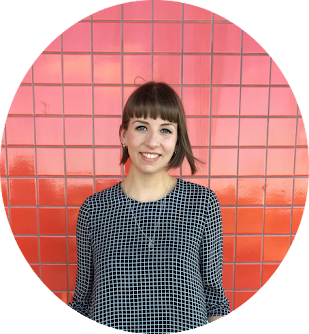 Love all the ways you styled it. My favorites are probably the last photo in the post, and the last photo in the quadtych above it. Excellent job! Thank you for such a lovely comment Ebi :) glad you like it! Thank you! 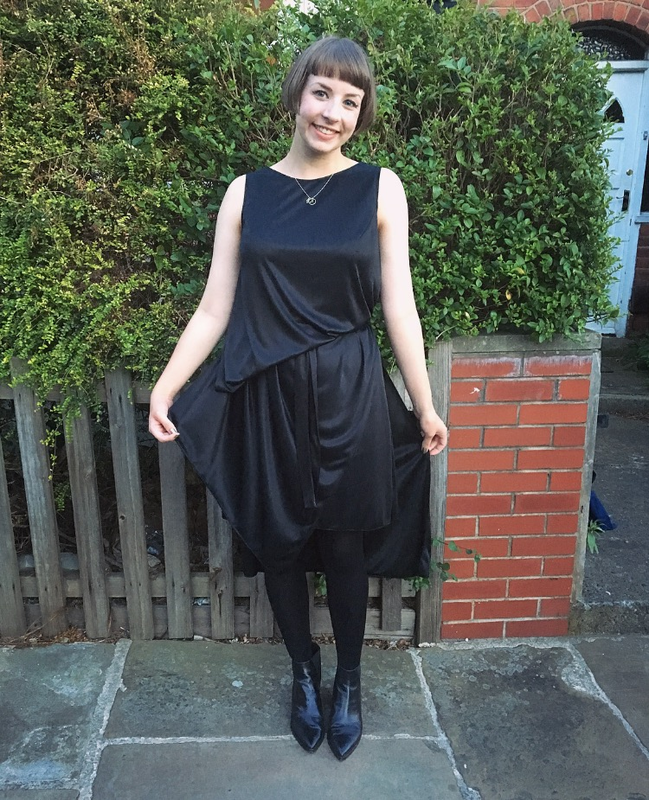 I've really been enjoying wearing/floating around in it!